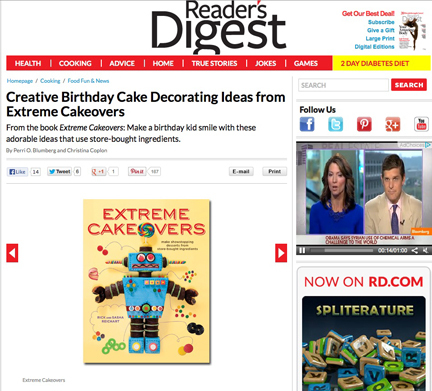 This entry was posted in News and tagged Extreme Cakeovers, Extreme Cakeovers book on August 30, 2013 by Sasha Reichart. Several months ago, one of our client’s at cakelava wanted a custom birthday cake for her husband around the time of our book’s release. 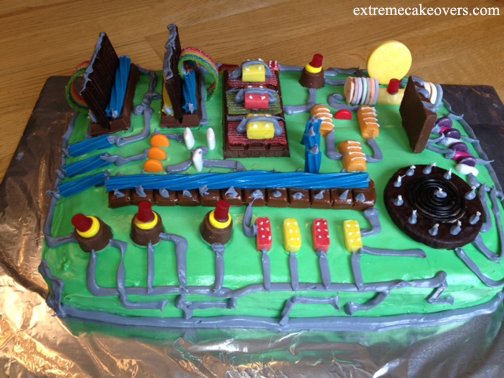 We were already committed and couldn’t make the cake, unfortunately. 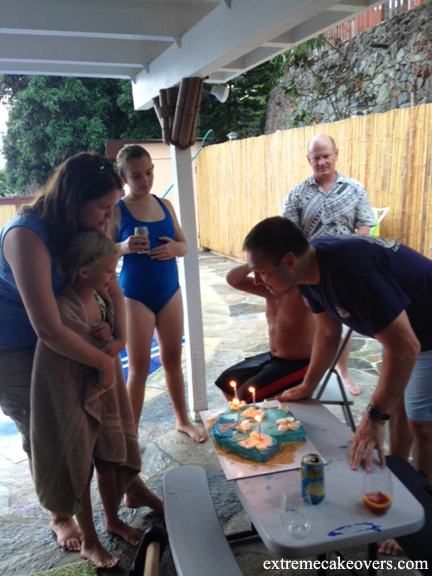 Shortly after their party, we were ecstatic to learn her 8-year old daughter made the Aloha Shirt cake from Extreme Cakeovers for her father’s birthday party, and she had documented the experience with step-by-step photos, which were sent to us. We were so happy to receive the photos and couldn’t believe our eyes! 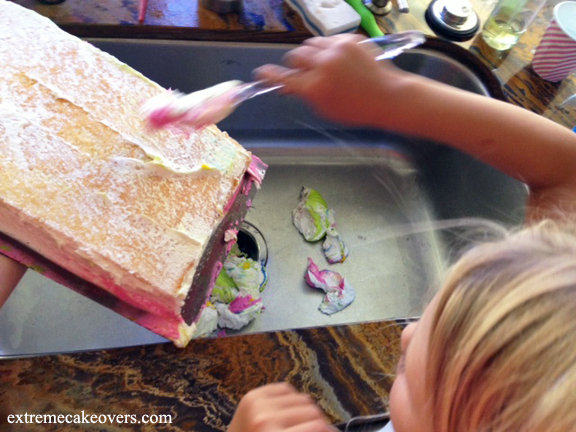 First, she scraped the frosting and decorations off the store-bought sheet cake. Once the sheet cake was prepared, the cut frozen pound cake sleeves were placed next to the shirt body. Using a ruler, she measured 1 inch below the top edge of the sheet cake and placed the pound cake sleeves with their diagonal sides against the sheet cake to form the shape of the shirt. 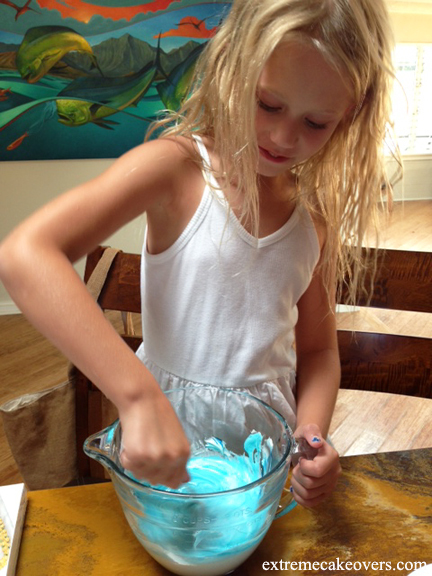 She scooped a can of store-bought frosting into a mixing bowl. Using an offset spatula, she frosted the Aloha shirt. 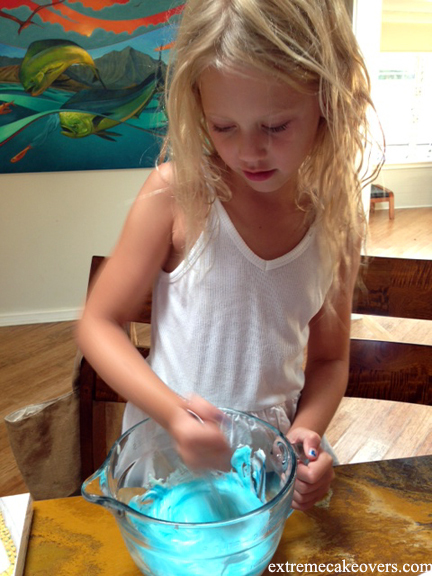 Look at her taking control of the frosting. She looks like a pro! 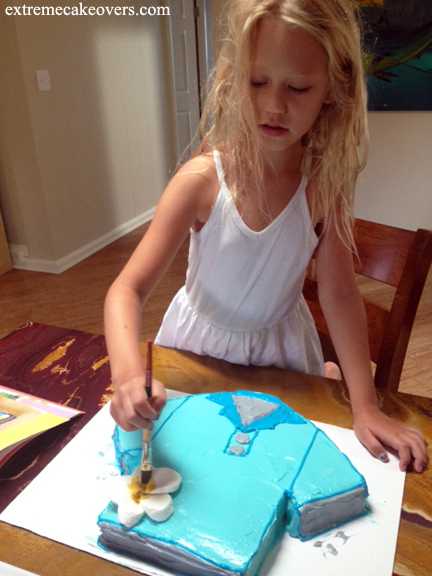 We love how she customized her Aloha Shirt cake to make it look like one her daddy would wear. He likes the pullover style of shirt, rather than a button down style, so she decided to make that one. 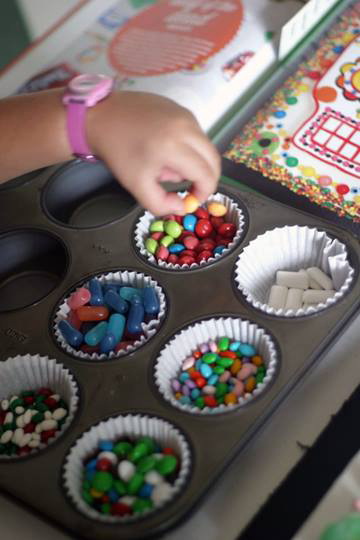 We want the readers to make the cakes their own, make it special to them! 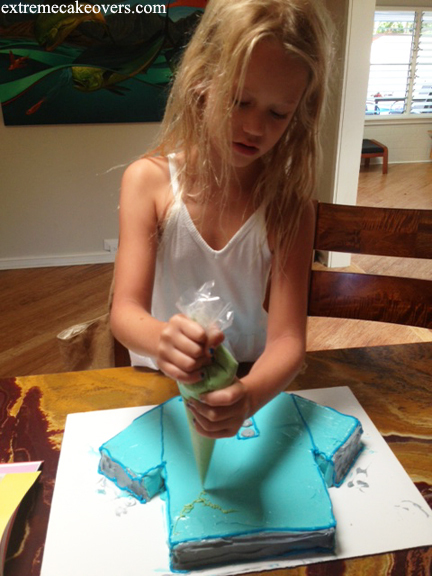 After mixing the green frosting and putting it into the plastic bag, she tested her pinhole cut – as suggested in the book – getting comfortable with the piping technique before making the green squiggly vines for the flowers. 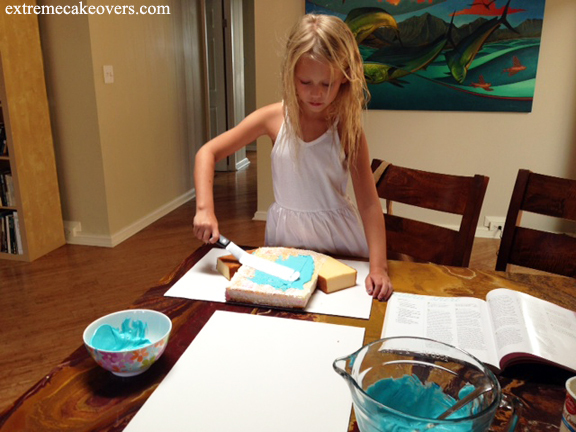 She tested directly on the cake, in an area that would be later covered with a marshmallow plumeria flower. Brilliant! She placed her first marshmallow plumeria flower near the bottom of the Aloha shirt. 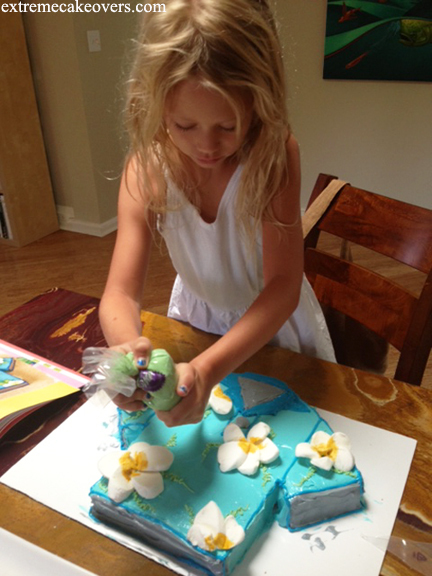 Using her paintbrush, she brushed the bottom third of each petal with yellow frosting. 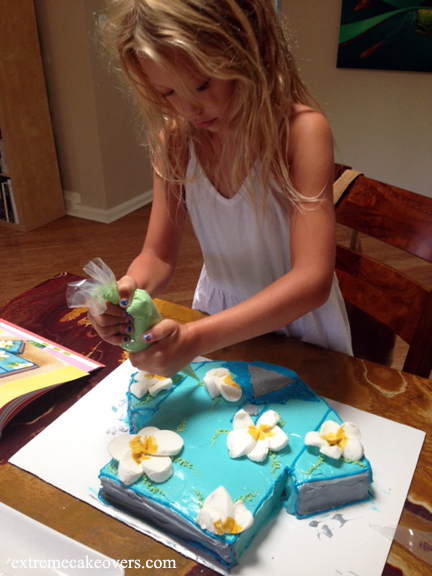 More marshmallow plumeria flowers were added to the cake, then she piped the squiggly vines. Her mother made a small confession to us. They forgot to pick up the Wrigley’s Spearmint Gum at the grocery store, which would be used to make the leaves of the plumerias, so they went without. We thought the shirt looked terrific, even without the leaves! All finished and ready to present to her daddy at his pool party! 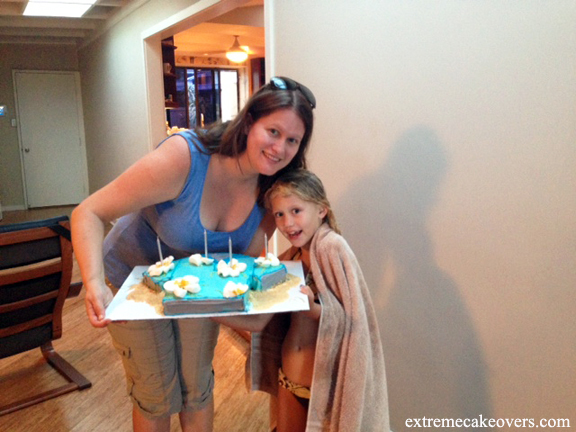 Here is our adorable little cake decorator and her mommy with their Aloha Shirt Cakeover! We adore this photo where she presents the cake she made (almost all by herself) to her daddy, who looks very happy to receive it! They couldn’t have selected a more perfect cake for the occasion and we were happy our Aloha Shirt cake was included in their celebration! 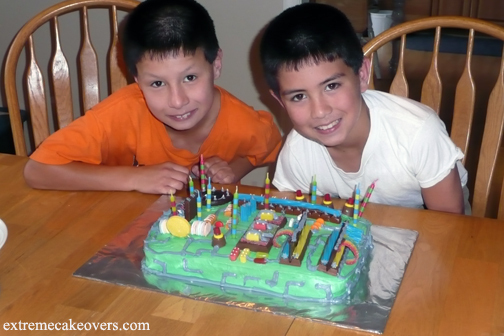 This entry was posted in News and tagged Aloha Shirt Cake from Extreme Cakeovers, Extreme Cakeovers, Extreme Cakeovers reader cakeover on August 13, 2013 by Sasha Reichart. In addition to the paperback and ebook versions of Extreme Cakeovers, Clarkson Potter has released a very special Apple iBooks Author version, an enhanced ebook offering a higher level of interactivity for the reader. 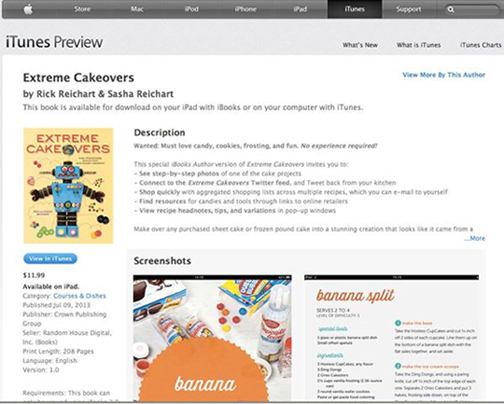 Included in the iBooks version are step-by-step photos of one of the cake projects and the ability to access shopping lists which can then be emailed to yourself. You can connect with the live Twitter feed for Extreme Cakeovers (@cakelava) and tweet about your cake from the kitchen! There are fun, pop-up windows, cake animations, and links to the online retailers to purchase products found in the book. The iBooks Author edition may be ordered directly from Apple iTunes here. We were thrilled when our editor Ashley told us there would be a special iBooks enhanced edition and that she would be making one of the cakes from the book for the ebook team to include in the Author edition. 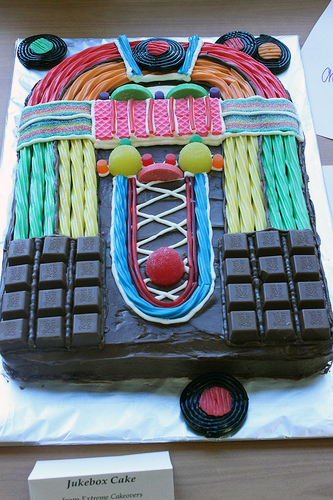 Ashley had previously impressed us when she made and presented our Jukebox cake to the team at the Clarkson Potter Summer 2013 Cookbook Launch in August 2012. 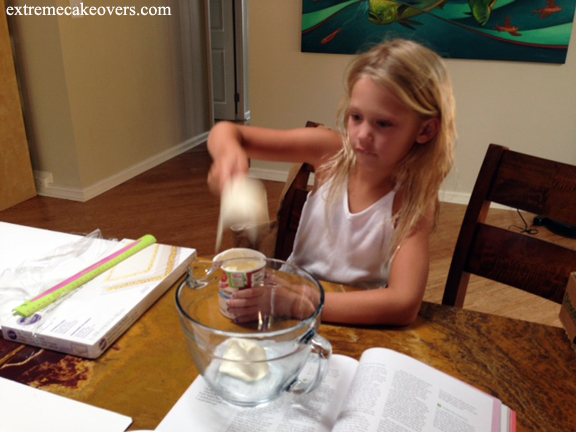 She was a cake making superstar and had no experience decorating cakes! 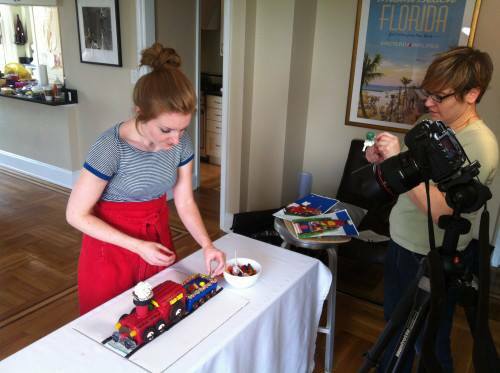 When we saw her finished Train cake, we were blown away and happy to be able to share her experience with readers of the iBook. 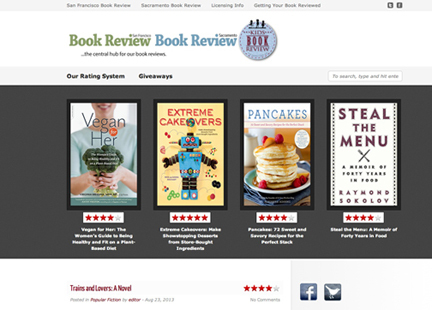 If you aren’t an avid follower of The Recipe Club, an online community for cookbooks presented by Clarkson Potter and Ten Speed Press, you should definitely check it out and join them on their social media! 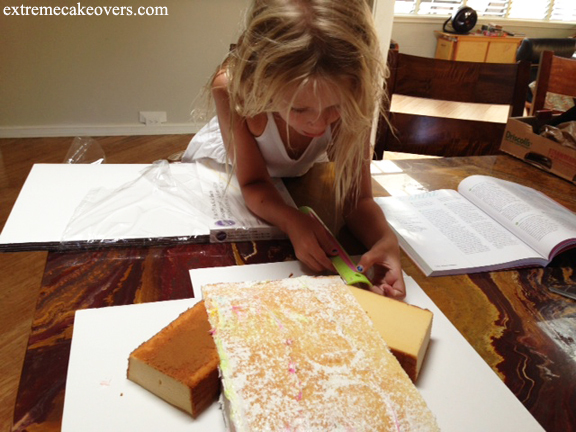 The Recipe Club recently posted a behind the scenes look at the Extreme Cakeovers iBooks photo shoot. 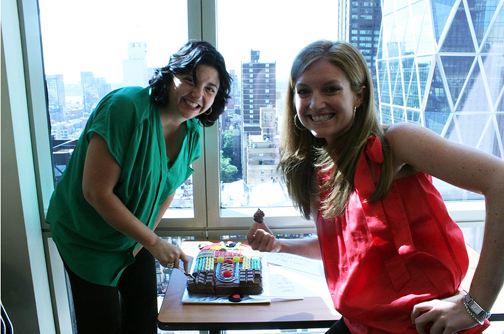 The story was written by Ashley Phillips, our book’s editor, and details her experience making the cake. 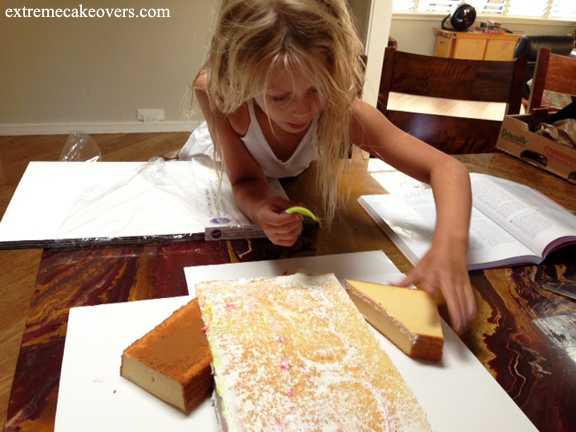 Ashley is now 2 for 2 with her stunning cakes, and we cannot wait to see what she makes next! 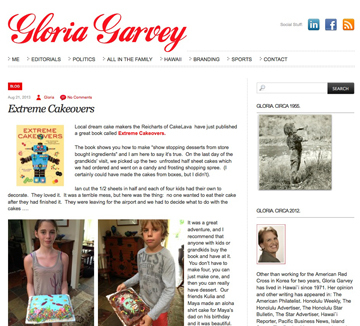 This entry was posted in News and tagged Extreme Cakeovers, Extreme Cakeovers iBooks Author, Extreme Cakeovers iBooks Author Edition on August 7, 2013 by Sasha Reichart.